If you're planning to travel to the Greater Phoenix area this December and are looking for some great holiday concerts, shows, and theatrical performances to put you in the Christmas mood, you're in luck. Phoenix, Scottsdale, and the surrounding area have tons of holiday offerings this time of year—you just have to know the right places to look. You could also attend a special holiday event or festival instead or check out some dazzling Christmas light displays. There are a number of opportunities to get your photos with Santa or grab a last-minute gift at area malls. No matter what you do, it's sure to bring holiday cheer around Phoenix. At Fountain Hills Theatre, there will be a "12 Days of Christmas" musical celebrating the holiday. Performances will run between December 7-23, 2018 on Thursdays, Fridays, and Saturdays at 7:30 p.m. and Sundays for a matinee at 2 p.m. There will also be a special Christmas sing-a-long show, "An Evening with Mrs. Claus" on December 16 at 7 p.m. A mix of music, comedy, and magic, this show will feature classic Christmas tunes such as "Santa Clause is Coming to Town," "I'll be Home for Christmas," "Jingle Bells," and more. Both of these shows are sure to delight, so if you happen to be in town for two consecutive days, it's worth it to see them! Hale Theatre: "A Christmas Carol"
For a slightly more adult version of the classic Dickens' tale, head over to the Hale Centre Theatre in Gilbert on select dates November 29 through December 24, 2018. This will be the 16th year that the Hale Theatre brings Dicken's Ebenezer Scrooge to life, a local favorite tradition for the holiday season. Space 55: "A Bloody Mary Christmas"
"A Bloody Mary Christmas" is the perennial holiday musical for people who hate the holidays and musicals. In it, Sun City retirees Blanche, Bertha and Mabel sing, dance, and drink themselves silly as they battle a heartless homeowner's association that tries to evict them from their condo on Christmas Eve. This show is NOT suitable for children, but dates run between November 23 and December 23, 2018, at Space 55's location in Phoenix. Arizona Broadway Theatre: "A Charlie Brown Christmas"
Along with a full schedule of major Broadway touring productions, the Arizona Broadway Theatre in Peoria also features a special Christmas production for children each year. In 2018, "A Charlie Brown Christmas" comes to the stage on various dates between December 7-22, 2018 with special "field trip" performances as weekday matinees. The ASU choirs join the ASU Symphony Orchestra for a program of seasonal favorites, including selections from Tchaikovsky's "The Nutcracker" and Vaughan Williams "Fantasia on Christmas Carols." The event takes place December 2, 2018. Phoenix Symphony: "A Cirque Nutcracker"
This year's holiday offering from the Phoenix Symphony Orchestra is a APS Pops Series by Troupe Vertigo. You'll hear classics like "White Christmas" and "Deck he Halls" as well as shows by contortionists, aerialists, and jugglers. Pairing up with the titular world-renowned Cirque troupe, the Phoenix Symphony sheds new light on an old favorite from December 7-9, 2018. Black Theatre Troupe: "Black Nativity"
"Black Nativity" by Langston Hughes is a song-play about a boy who runs away from estranged relatives to try to find his mother on Christmas and discovers a deeper, spiritual meaning to the holiday season. With hints of gospel, blues, jazz, and funk, this is a Christmas show unlike any other. Dates for performances run from November 30 through December 16, 2018. Valley Youth Theatre: "A Winnie-the-Pooh Christmas Tail"
Presented by Valley Youth Theatre, this Phoenix holiday tradition has been delighting Valley families since 1995. Join Pooh, Piglet, Eeyore, and all their friends in the Hundred Acre Wood for a musical celebration of seasonal sharing and caring on select dates from November 30 through December 23, 2018, at the Valley Youth Theatre in Phoenix. Celebrity Theatre: "Alice Cooper's Christmas Pudding"
"Christmas Pudding" brings together some of the finest musicians, dancers, and comedians in today’s entertainment world to create a magical evening of music, comedy, dance, and a bit of mayhem for this annual tradition at the Celebrity Theatre in Phoenix. This year, the 16th annual event takes place on December 8, 2018. Featuring traditional and contemporary holiday songs along with an audience sing-a-long of everyone’s favorite Christmas carols, the Orpheus Male Chorus will be making appearances in Litchfield Park (December 9), Mesa (December 11), Phoenix (December 14), and Paradise Valley (December 16). Musical Instrument Museum: "Irish Christmas in America"
Now in its 13th season, this family-friendly performance (on December 16, 2018) features Irish ballads, lively instrumental tunes, and Irish dancing while photographic images provide a backdrop to some of the rich historical traditions of Ireland. Take a glimpse into the enchanting spirit of Christmas at the MIM Music Theater in North Phoenix. Phoenix Boys Choir: "Halle Holidays"
This season, the Phoenix Boys Choir will perform holiday music at various venues across the Valley as part of their annual Christmas concert series. The uplifting and inspiring selections, certain to entertain and delight audiences of all ages, complete the "Halle Holidays" show, sponsored by the Halle Foundation. Performance dates take place between December 7 and 20 in 2018. Tempe Symphony Orchestra, made up of volunteer performers and owned and operated by the City of Tempe Library & Cultural Services Division, brings back its annual holiday concert for one night only this December 27, 2018, at the Tempe Center for Performing Arts. Featuring classic and modern Christmas tunes, this display of local talent is certainly worth the trip if you're still in the holiday mood after Christmas Day. Featuring The Phoenix Symphony's Music Director Tito Muñoz as he leads the Valley’s favorite holiday tradition, the Phoenix Symphony and Chorus will perform Handel’s "Messiah" in select churches and venues across the Valley. Performances run from December 12 through 16, but be sure to check out the official website to see where they'll be and when. Follow Clara and her magical Nutcracker Prince as they embark on a thrilling adventure in this Ballet Arizona performance of "The Nutcracker" featuring live music of the Phoenix Symphony at the ​Symphony Hall in Phoenix on select dates from December 13 through 24. Scottsdale Center for the Performing Arts: "Sister's Christmas Catechism"
Sister, the tart-tongued, ruler-wielding nun, teaches her students the story of the Nativity and asks for their help to solve the greatest Christmas caper ever—who swiped the gold that those three wise men gave to Baby Jesus? Using the latest forensic technology and her uncanny ability to detect guilt, Sister creates an unforgettable living Nativity with her students to expose the culprit. Part of the "Late Nite Catechism" comedies, each performance is unique and will appeal to people of all ages and faiths. Performances take place at the ​​Scottsdale Center for the Performing Arts on select dates from December ​7-16, 2018. On Saturday, December 8, the Symphony of the Southwest returns to the Mesa Arts Center to perform a festive concert of traditional holiday music featuring the Chandler-Gilbert Community Choir directed by Marc Denton. The holiday concert features favorite tunes like Tchaikovsky's Nutcracker Suite and "It's the Most Wonderful Time of the Year." Sonoran Desert Chorale: "Sing We Now of Christmas"
The Sonoran Desert Chorale translates feelings of hope and joy into songs accompanied by brass, percussion, and two of the mightiest organs in the Valley for their 25th annual Sing We Now of Christmas holiday show. Continuing with the exploration of the music of Ireland and the British Isles, they will sing many pieces steeped in this tradition with beautiful lyrics presented by a rich blend of 60 voices. Performances take place in Mesa and Scottsdale December 8 and 9, 2018. The Duttons: "The Duttons' Christmas Show"
The Duttons are a real family of singers, dancers, and musicians that are guaranteed to please all ages. After qualifying for the finals on the NBC hit show "America's Got Talent" in 2016, the Duttons' career has taken wing, and this year the Duttons return to Mesa for performances of holiday classics and family favorites from December 13 through 15. 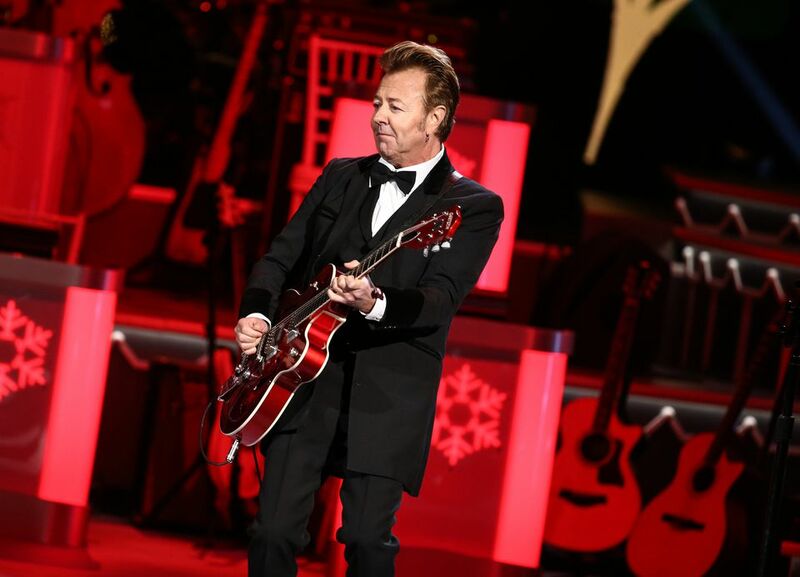 Three-time Grammy-Award winner Brian Setzer and his 18-piece orchestra will feature music from his best-selling holiday albums at the ​Celebrity Theatre in Phoenix for one night only: Saturday, December 15 at 8 p.m.
Phoenix Chorale: "A Chorale Christmas"
Phoenix Chorale presents a Christmas program filled with unique arrangements of holiday classics. This year’s Chorale Christmas will also feature familiar favorites like “Huron Carol" and "Winter Wonderland." Performances take place at various venues in Phoenix and Sun City from December 14-18, 2018. The Platinum®-selling Sol de Mexico is the first mariachi ensemble to be nominated for a Grammy Award. Their original rhythms, fresh sounds, and inspiring ideas have energized the world of mariachi for more than 30 years. This special performance, on December 15, 2018, at the Scottsdale Center for the Performing Arts, includes treasured holiday favorites and selections from the mariachi songbook. The only "Nutcracker Ballet" performed by young dancers age 3 to 22, the Ahwatukee Foothills' production features a special appearance by Santa Claus following the 2 p.m. performances on both December 15 and 16 at the Desert Vista Fine Art Theatre. Who's Coming to Phoenix to Perform in February?